Morton and Dundee United will meet in the Premiership play-off quarter-final after United missed out on finishing second in the Championship. The Tangerines needed to win and for Falkirk to drop points to finish second and progress to the semi-final. The Bairns beat Dumbarton 1-0. 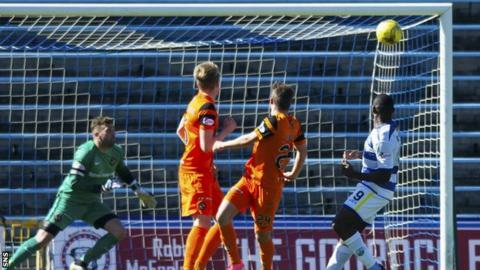 After Tony Andreu hit the bar for United in the first half, Kudus Oyenuga headed Morton ahead in the second. But Blair Spittal struck from 10 yards to draw the sides level. Fourth-placed Morton, who were earlier forced to bring on Michael Tidser for the injured Ross Forbes, then lost goalkeeper Bryn Halliwell, James McGowan coming on. Substitute Aidan Nesbitt came close for the home side, keeper Cammy Bell denying the on-loan Celtic midfielder with a fine save. The sides will meet twice more in the next six days. The first leg of the play-off quarter-final will be back at Cappielow on Tuesday, with the return at Tannadice on Friday. And the winner will take on Falkirk in the semi-final on 16 and 19 May, with the final against the Premiership's second bottom side played over 25 and 28 May. Match ends, Morton 1, Dundee United 1. Second Half ends, Morton 1, Dundee United 1. Attempt blocked. Mark Durnan (Dundee United) header from the left side of the box is blocked. Attempt saved. Aidan Nesbitt (Morton) right footed shot from the centre of the box is saved in the bottom left corner. Substitution, Dundee United. Alex Nicholls replaces Willo Flood. Attempt missed. Tony Andreu (Dundee United) left footed shot from the centre of the box is high and wide to the left. Foul by Thomas Mikkelsen (Dundee United). Attempt missed. Scott Allardice (Dundee United) right footed shot from outside the box misses to the left. James McGowan (Morton) is shown the yellow card. Substitution, Morton. Aidan Nesbitt replaces Kudus Oyenuga. Attempt missed. Tony Andreu (Dundee United) left footed shot from outside the box is too high. Attempt saved. Scott Allardice (Dundee United) left footed shot from outside the box is saved in the top centre of the goal. Lewis Strapp (Morton) wins a free kick in the defensive half. Foul by Andy Murdoch (Morton). Willo Flood (Dundee United) wins a free kick in the attacking half. Substitution, Dundee United. Scott Allardice replaces Wato Kuate. Wato Kuate (Dundee United) is shown the yellow card for a bad foul. Kudus Oyenuga (Morton) wins a free kick in the defensive half. Foul by Wato Kuate (Dundee United). Corner, Dundee United. Conceded by James McGowan. Attempt saved. Blair Spittal (Dundee United) left footed shot from the left side of the box is saved in the bottom left corner. Substitution, Dundee United. Charlie Telfer replaces Alistair Coote. Foul by Michael Doyle (Morton). Alistair Coote (Dundee United) wins a free kick in the attacking half. Substitution, Morton. James McGowan replaces Bryn Halliwell because of an injury. (Morton) wins a free kick in the defensive half. Attempt saved. Thomas Mikkelsen (Dundee United) right footed shot from the centre of the box is saved in the centre of the goal. Attempt missed. Thomas Mikkelsen (Dundee United) header from the centre of the box is close, but misses to the left. Goal! Morton 1, Dundee United 1. Blair Spittal (Dundee United) left footed shot from the centre of the box to the bottom right corner. Assisted by Tony Andreu. Attempt missed. Alistair Coote (Dundee United) header from the centre of the box is close, but misses to the left. Substitution, Morton. Michael Tidser replaces Ross Forbes because of an injury. Andy Murdoch (Morton) wins a free kick in the defensive half. Foul by Willo Flood (Dundee United). Attempt saved. Blair Spittal (Dundee United) left footed shot from outside the box is saved in the centre of the goal. Goal! Morton 1, Dundee United 0. Kudus Oyenuga (Morton) header from the centre of the box to the bottom right corner. Assisted by Mark Russell. Delay in match Ross Forbes (Morton) because of an injury.